These Odelia Grey mysteries satisfy me so. Jaffarian includes much more than just the crime and sleuth aspect; some of the books focus on Odelia and her attorney boss Mike Steele. Others give us strong subplots involving Odelia’s friends on the police force. This latest in the series includes rock stars, bodyguards, and the delicate relationship between a strong daughter and her strong mother. 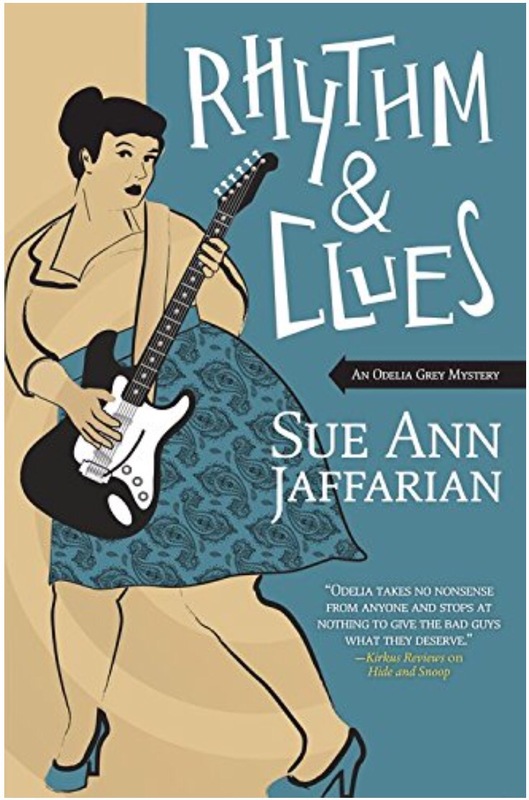 While rock legends don’t do it for me (and so I was a little bored with that part of the plot), Odelia unraveled murders with her signature stubbornness and throwing caution to the wind. I loved the middle-of-the-night meddling, the saving grace of Odelia’s formerly criminal friends, and the comic relief that reminds me of Stephanie Plum. Much to my delight, Jaffarian also surprised me in Rhythm & Clues with my most favorite part of any book ever: the hint of a romantic happily ever after. 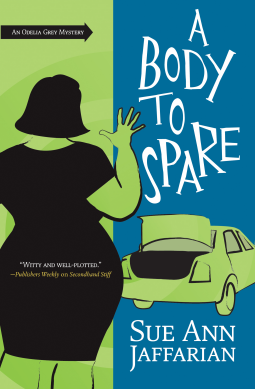 Here we have Book 10 in the Odelia Grey Mystery series… And it’s TERRIFIC. Jaffarian makes Odelia’s crazy world of hit men, private eyes, cops and ex-cons seem almost run of the mill. But it’s still a surprise to find a dead guy in the trunk of her car. The dead guy has a bizarre past. Odelia and the gang manage to dig into it and find more than one bad apple who could be responsible. As usual, the more they know, the deeper trouble they get themselves into. Jaffarian rocks at creating believable relationships. Whether it’s Odelia’s marriage, immediate family, or professional contacts, I like eavesdropping on their conversations and coming along for the ride while they solve the mystery. Paralegal and accidental sleuth Odelia Grey and her husband Greg witness a murder, and it appears to be committed by one of their friends! With Odelia’s boss home recovering from injury, Odelia has plenty of time to play detective and find out whodunit. As with all the books in this series, I love Odelia’s candor and blunt approach. This particular mystery included quadriplegic rugby, traffic on the 405, help from the baddest criminal in town, and a very unexpected romance (oh, that part made me HAPPY). Sue Ann Jaffarian writes a fun, witty, heartwarming story about good versus evil, family relationships, and that dance we call marriage. Jaffarian happens to move the plot along by having the characters go after a murderer… The thrill of the chase, you know?! Rabbi Jeremiah is in transition. He’s falling in love, being asked to help with the church next door, dragged into a crazy serial murder mystery, and trying to be true to himself – even though he’s still figuring out who he is. Luckily, his longtime friend and confidante Cindy is right by his side. Trouble is, can Jeremiah keep her safe – and his heart safe – while they figure out who is behind the witchy crimes?! Viguie did a fantastic job integrating Halloween, church, synagogue, murder, witches, a costume party, and a youth group haunted house. Oh and romance with an alpha. Yup. You heard me. ROMANCE. Just a bit. 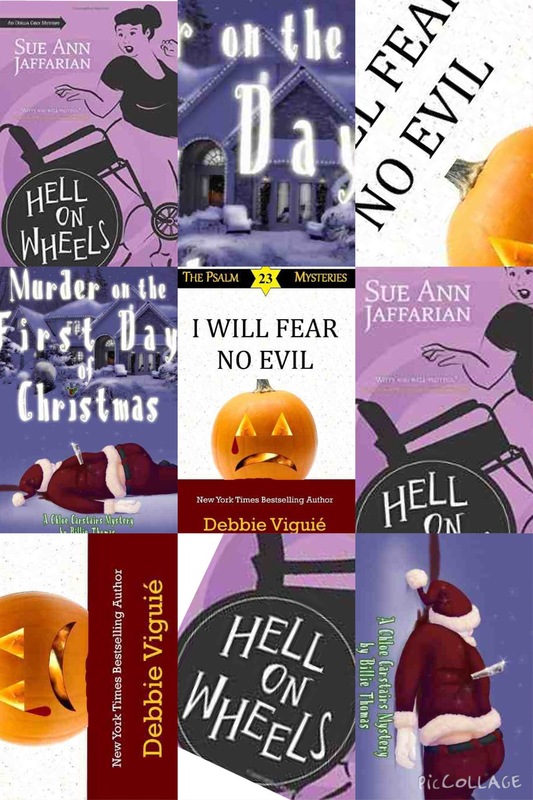 Debbie Viguie writes the Psalm 23 Mysteries so fast my head spins. The plot moves quickly, the dialogue is spot-on, and she doesn’t rush relationships. I am chomping at the bit everytime there’s an impending release. Chloe and her mom are interior decorators. They have special access into people’s homes, and are sometimes privy to dangerous secrets. When the mother-daughter team does up some fancy mansions for Christmas, they are surprised by the “gifts” they find: a dead man’s hand, a rat, a dead Santa, and a very confusing (and enlightening) version of The Twelve Days of Christmas. The women keep sticking their noses where they don’t belong, until they are confronted by the killer. Not to worry, the Carstairs pair use Southern charm – and their newfound friendship with the Law – to keep themselves alive. It’s super fun to read about over-the-top Christmas parties, evening gowns up to here and down to there, quirky characters, and a mother-daughter relationship that goes from rolling eyes to warm embraces. Billie Thomas successfully weaves together family banter, a murder mystery, and a little bit of Christmas romance.